MIT EMS volunteers provided hands-on CPR training to 39 grad students in Ashdown, Sidney Pacific, and Edgerton graduate dorms. Thanks to the efforts of a dedicated group of student volunteers during Cardiac Health and Stroke Awareness Month, more members of our campus community are now trained in life-saving skills and are prepared to intervene in a cardiac emergency. 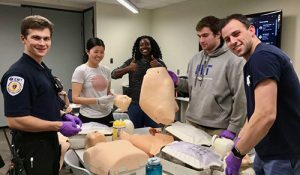 During the 2016-2017 academic year, four undergraduate students and members of MIT Emergency Medical Services (EMS) submitted a proposal for a Graduate Student Life Grant (GSLG) to fund a series of dinners and training sessions for graduate students interested in learning Hand-Only CPR. The panel that reviews proposals for these grants, which are administered and funded by the Office of Graduate Education (OGE), was impressed by the proposal author’s goal of reaching the graduate community, which has historically been difficult because the majority of EMS volunteers are undergraduates. MIT EMS hoped that its presence in graduate dorms throughout these events would support their goal of recruiting more graduate students to become EMTs. The presence of EMTs in graduate dorms has many benefits, such as increasing the feeling of security among residents, and providing a trusted source of informal medical advice. In November and early December, MIT EMS collaborated with leadership in three graduate dorms (Ashdown, Sidney Pacific, and Edgerton) to organize and publicize three in-residence dinners and interactive hands-only CPR trainings for 39 graduate students, delivered by four MIT EMS members. Participants were enthusiastic to share dinner with their peers and receive the training. CPR is a skill that takes only minutes to learn, but has vast life-saving potential for victims of cardiac arrest who would not otherwise survive. Thanks to the MIT EMS HeartSafe Program’s mission to spread this knowledge throughout the MIT community, more students in our residences and classrooms are equipped to respond to emergency situations.